The subject of this installment: Bot Colony, developed and published by North Side and played on PC. Bot Colony is a bit of an odd beast, and tough to talk about. That’s because it’s been in some form of development for more than a decade, though its current form is about four years old. North Side has taken on the challenge of building a game around speech recognition technology, the core of which is called “Natural Language Understanding” (NLU). The game entered Steam’s Early Access program and then left for lack of sales — fan support and donations prompted a recent update and a return to the platform, essentially reviving Bot Colony for another go at success. It’s difficult not to respect the game’s ambition. Bot Colony is a hard sci-fi title built around players commanding robots remotely via their own speech. North Side’s NLU technology recognizes natural speech patterns rather than being limited to overly rigid or limited static command phrases, so the game’s characters should react in a realistic way, . At least, that’s the idea. In practice, Bot Colony struggles to justify the faith that its fans have shown. If nothing else, the work is immediately intriguing. 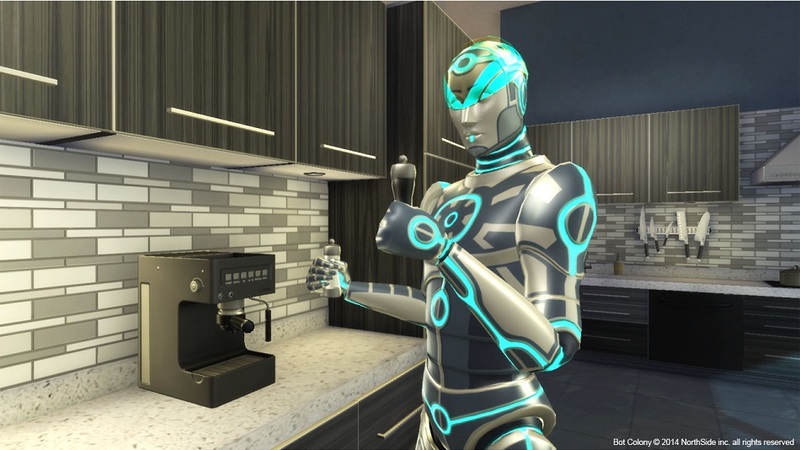 Players are thrust into a near-future where robots have become ubiquitous helpers in human society. Cast in the role of a freelance roboticist, they are “hired” to aid Nakagawa, a giant Japanese robotics conglomerate based on the Pacific island of Agrihan. Espionage and corporate intrigue abound, and it’s their task to uncover and investigate crimes using their command of the island’s many “bots”. The setting is well thought-out (if perhaps a little cliche’) and shows sincere love for plausible, rules-based science fiction. The game even comes with an accompanying novel for those who want to delve even further into the material. The reality of Bot Colony is that it’s as frustrating as it is inspiring. To be blunt, it just doesn’t work all that well right now. Even after multiple minutes-long “training sessions” designed to get the computer to accurately recognize the player’s voice, Bot Colony‘s bots are almost unconscionably dim-witted. Questions and commands will need to be stated and restated multiple times to get them to respond properly, and even after incorporating the latest content from the recent “investigation” update, it feels more efficient to use a keyboard to type in the questions manually. In the end, I got a lot farther at a much faster rate by muting my microphone and treating the game as a fancy chatbot, rather than engaging with its technology. It’s troubling that Bot Colony‘s central selling point is also its primary liability. At the same time, there’s something undeniably attractive about the prospect of being able to simply “talk” to a machine in the way one talks normally, and have it respond in a (somewhat) intelligent manner. Just ask Siri and Alexa. And when Bot Colony works and the fiddly speech recognition lines up just so, the magic is there — players aren’t chumps trying to talk to their computers any longer, but sci-fi detectives grilling a machine “witness” about the circumstances behind the theft of a valuable prototype chip. Unfortunately, the occasions when things work properly are a tad too infrequent to warrant a full recommendation. This is especially evident when playing the older of the game’s two available missions. That one has players manipulating an airport’s baggage bot to find a bomb, and predates improvements made to the speech recognition. It’s especially egregious in its inability to take commands. It’s a good thing that Bot Colony continues to remain an early access title, because it simply isn’t ready for primetime. There’s no denying the appeal of its ambition, and on that front I can’t help but wish North Side the best of luck in reaching its goal, but for now it’s best played by those who love the concept and are especially forgiving. A fair point! For my part I managed to uncover 11 of the videos, though the scenario started bugging out and awarding me credit for videos I was pretty sure I hadn’t unlocked yet, so I can’t be sure as to the true count. When I tried the scenario a second time, Jimmy simply wouldn’t unlock *any* videos, claiming it didn’t know anything about any of the topics I used, even after I used identical phrasing in keyboard entries. It was at that point I decided to move on. It would help us to know how you accessed it the second time, if you remember. Did you exit to DESKTOP after the first game, continue from a checkpoint, exit to MAIN MENU and then CONTINUE? There should be a maintenance version out by end of this week. You can also post the problem on Bot Colony discussions.